UPDATED: Tue., May 16, 2017, 9:30 p.m.
OLYMPIA – Washington taxpayers will spend more than $8 billion in the next two years on roads, bridges and mass transit projects, with about $127 million of it coming to Spokane County. Gov. Jay Inslee signed the 2017-19 transportation budget, which continues a major increase in transportation spending put in place two years ago when the state raised its gasoline taxes and some other fees to carry out more major projects. The biggest chunk of state transportation money coming to Spokane in the next two years – slightly more than $75 million – will go to the North Spokane Corridor. Another $740 million is scheduled for that project over the next eight years. 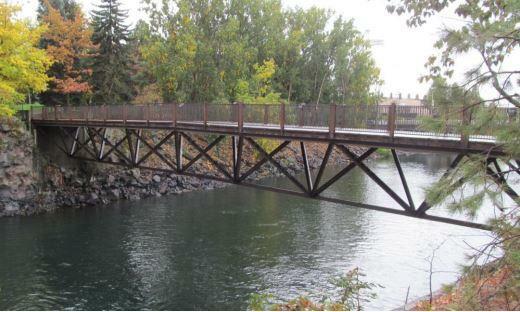 While that’s the biggest project listed for Spokane County, among the smallest is $300,000 for replacement of the deck on the Triangle Truss Bridge in Riverfront Park that connects Havermale Island with the Hotel RL by Red Lion Spokane at the Park. The 172-foot bridge was built to carry people over the north channel of the Spokane River for Expo ’74. $8.1 million for the Central City Line. $8.1 million for the West Plains Transit Center. $7.7 million for a series of road preservation projects that include sections of Interstate 90, state Route 290 between Hamilton Street and Mission Avenue, and state Route 904 between Mullenix and Betz roads. $3.9 million for Spokane Transit Authority’s Monroe-Regal High Performance Corridor, with a 100-stall park and ride, shelters, pads and ticket machines on the South Hill. $2.1 million for the Spokane Falls Community College Transit Center. $2 million for rail development on the West Plains and at Spokane International Airport. Other projects partially in Spokane County included in the budget are $10 million for a passing lane on U.S. Highway 195 between Colfax and Spangle, and $6.7 million for rehabilitation of the Palouse River and Coulee City Railroad. Published: May 16, 2017, 1:33 p.m. Updated: May 16, 2017, 9:30 p.m.